After the first round of seam and hole filling last week, I sanded everything down and did a much smaller fill session to take care of the areas I missed or didn't quite get right the first time. Of course, I had to wait another day to wait for everything to dry and sand this down, so it can be frustrating at times. At this point in the build, things have started to slow down a bit (compared to the big gains of early on), and I have to multi-task to make sure I keep moving. With that said, while waiting for the second filler coat to dry, I started building the daggerboard trunk. 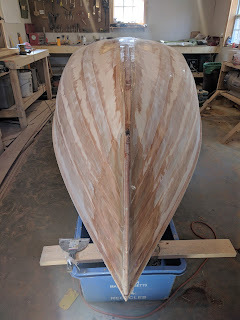 I didn't get too far past cutting the 6 mm plywood to the proper dimensions (I had marked out the location and scribed the curve of the hull onto a piece of scrap before I flipped the boat), before I had to break out the epoxy again and put the first of 2 coats on what will be the inside of the trunk. The second coat will be a layer of 6 oz cloth with a graphite coating. Then I can start to cut out the bed logs, struts, and end pieces. I have a few nice pieces of mahogany that will be perfect for the job. Back to the hull once the filler was cured, I sanded it all down again and was pretty satisfied that I was ready for the next step: tape. I started with a single seam, mixed up a 3 oz batch of epoxy and 'painted' it on the the length of the hull with a chip brush. Then I took my roll of 7 mm 6 oz cloth tape and rolled it along the seam from the stern forward to the bow, pressing the tape to the wetted out area as I went. Then I went back with a plastic squeegee and made sure the tape was saturated. As luck would have it, 3 oz batches of epoxy was the perfect amount for each seam (there are 10 total). By the last seam, I had the technique down and it only took about 10 minutes. I cleaned up and called it a day. This morning I shaped and mounted a piece of mahogany to the bow for the stem with screws and epoxy. Along with the stem, I also mounted the 25 x 15 mm 'keel' as far aft as the forward part of the daggerboard location. 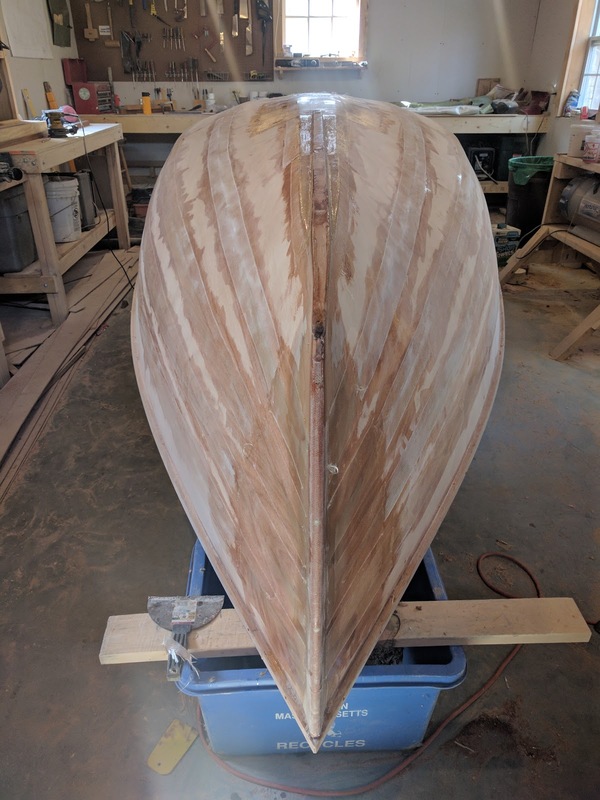 The weather has been warm and I have been using cold weather hardener, so by late today, everything had cured nicely and I was able to start shaping the stem and keel. Next up I will be skim coating the hull with fairing compound to keep the tape reasonably hidden once I sheath the hull. 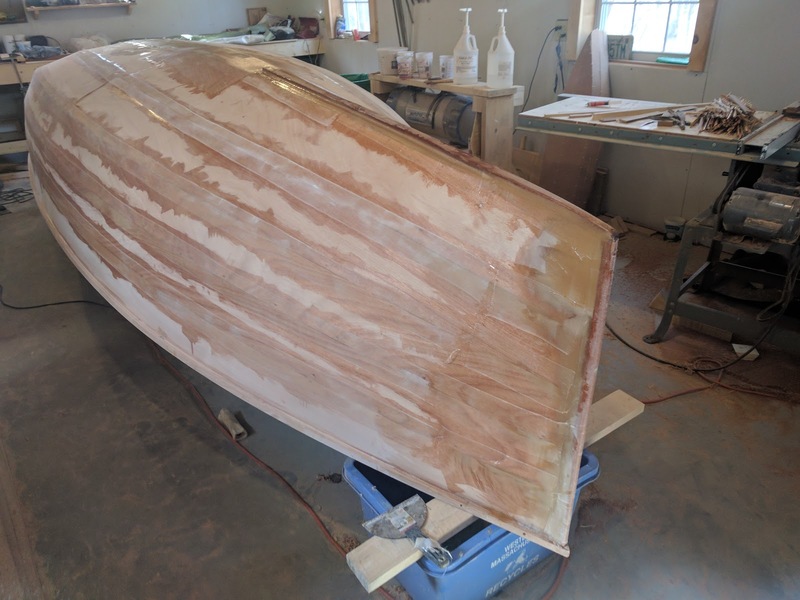 I know I will have to do more fairing after the sheathing, but this will be a good step in making the hull fair.